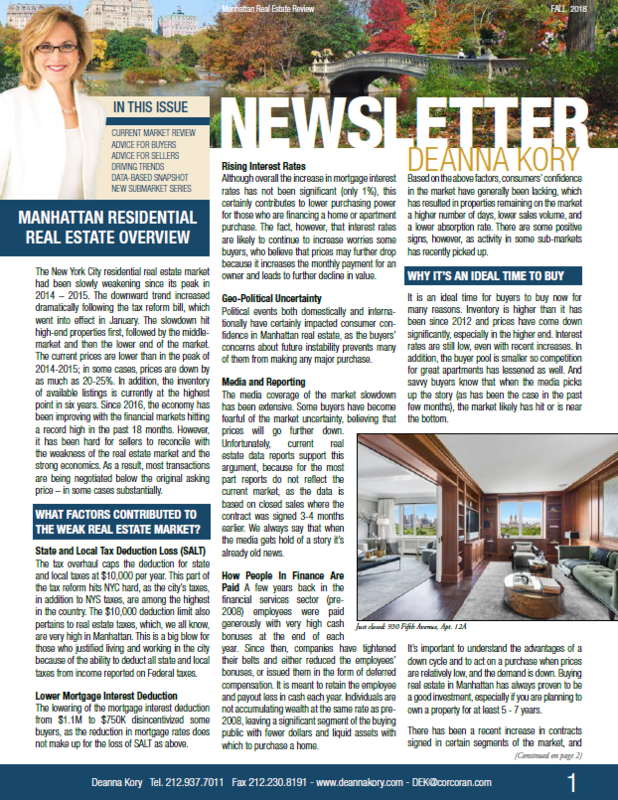 Deanna Kory has distinguished herself as one of the leading agents in Manhattan. 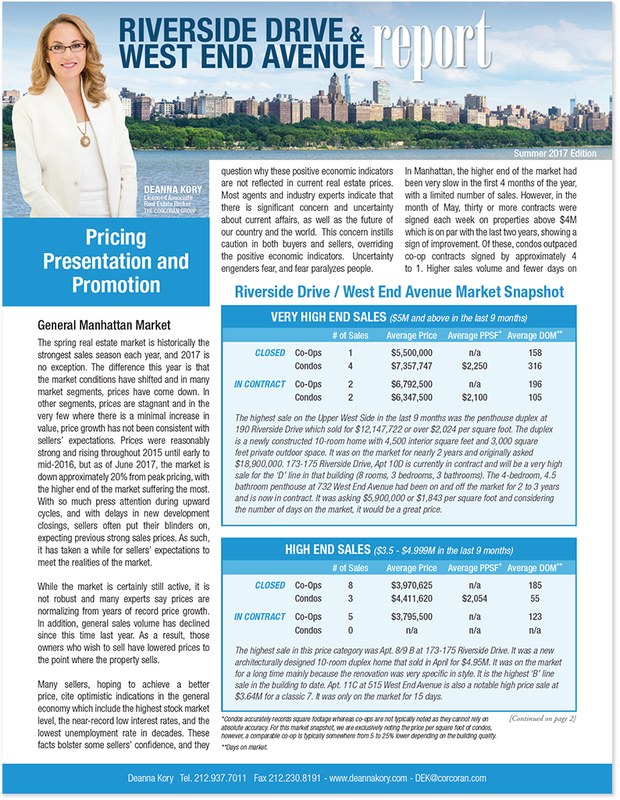 With over 30 years of experience in residential real estate, she has built a reputation as a hard-working broker with the intellect, knowledge, sensitivity, and expertise to assist all of her clients in realizing their real estate goals. 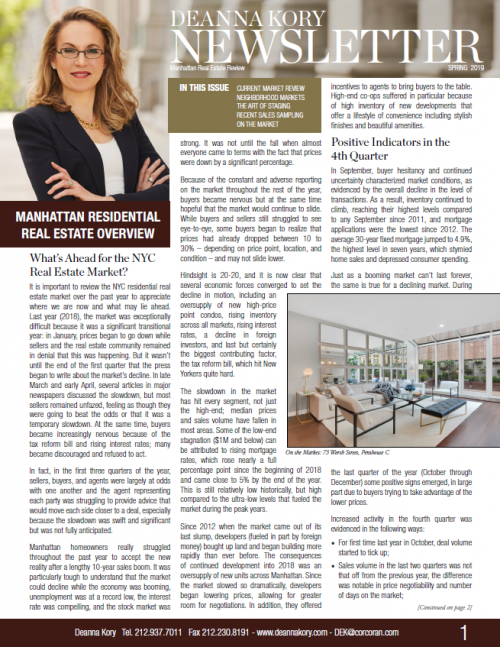 Along with her team, Deanna has sold well over $1.5 Billion of residential real estate in Manhattan in the last decade alone. 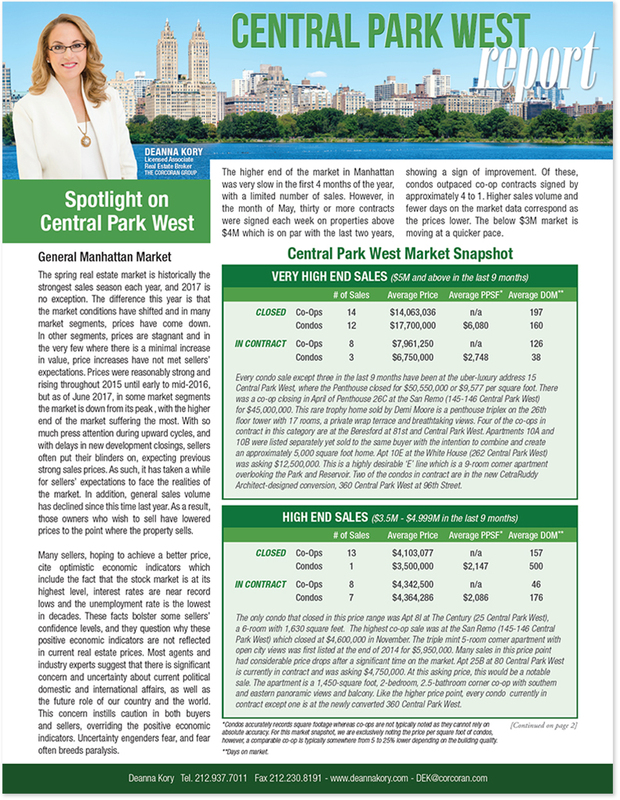 What’s Ahead for the NYC Real Estate Market? It is important to review the NYC residential real estate market over the past year to appreciate where we are now and what may lie ahead. 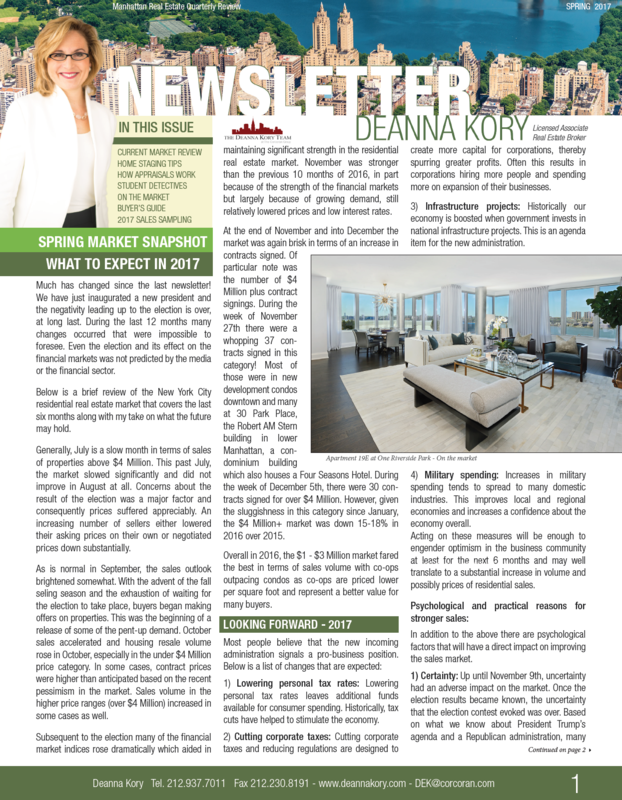 Read our Spring Newsletter to learn more about what to expect in the 2019 real estate market. 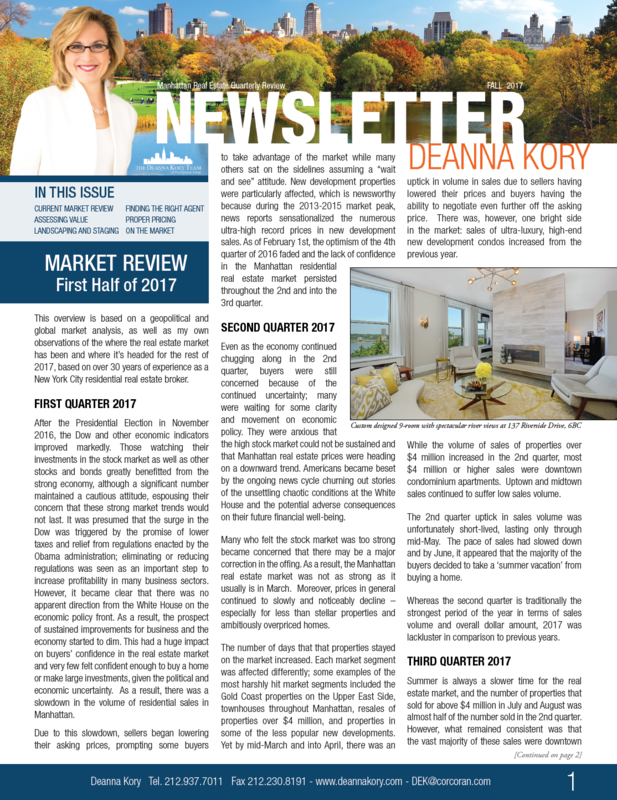 Click here to download the Spring 2019 Newsletter. 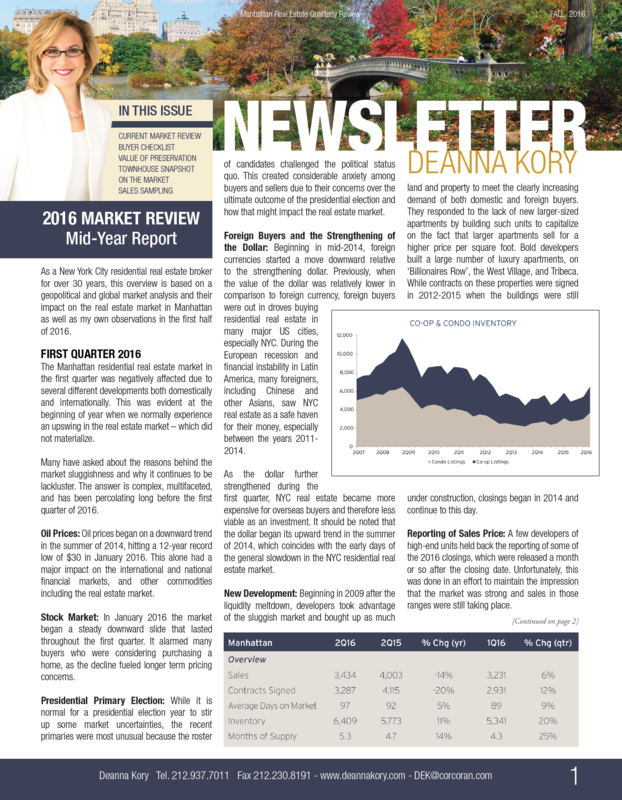 Deanna Kory produces a variety of exclusive newsletters that speak to specific market segments. 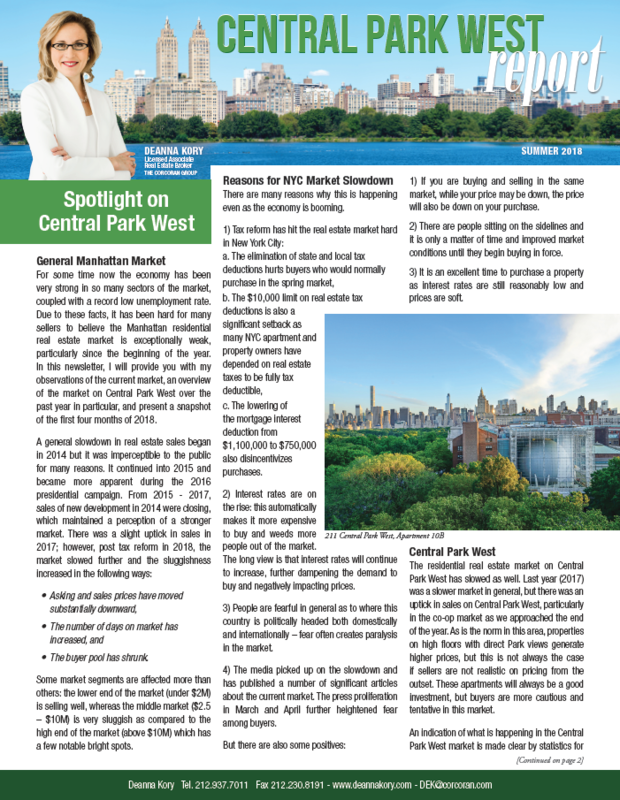 These publications contain an analysis and data of the state of that market, features on new listings and developments, articles written by industry professionals on a wide range of topics, and advice to help the average New Yorker navigate the market. 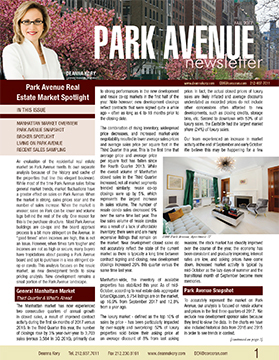 Newsletters include Deanna’s seasonal quarterly newsletter, The Condo Report, The Luxury Newsletter, The Townhouse Edge, The Riverside –West End Avenue Report and the Central Park West Perspective. 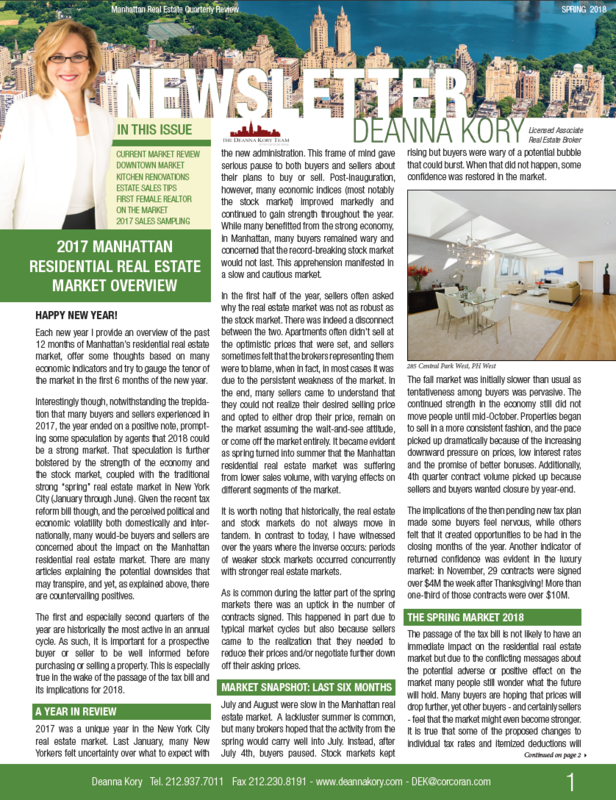 The Deanna Kory Team’s monthly eNewsletter includes our expert analysis plus statistical charts to help you understand the current real estate market in Manhattan. 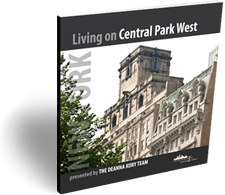 Our team has created a series of three exclusive coffee table books of photography celebrating life on some of the most iconic residential thoroughfares; Central Park West, Riverside Drive and Park Avenue. The Deanna Kory Team works to stay ahead of the industry in creating beautiful and unique marketing materials and developing innovative custom marketing strategies for their clients. Our team is comprised of seasoned professionals who are highly skilled in the many facets of buying and selling real estate in NYC. 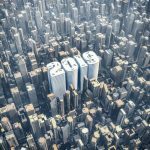 By offering our combined talents, we are uniquely positioned to assist our clients in realizing their real estate goals. Our team is skilled in providing extensive analysis in a sophisticated and complex real estate market. From understanding net profit, capital gains, to detailed comparable evaluations, we offer the knowledge, data and information our clients need to be competitive.